Sign up for a regular delivery of the world’s finest chocolate. How much is your chocolate and your subscription boxes? We are currently offering a price of £19.95 a month when subscribing to a monthly payment. This includes UK postage and packing. It’s free for all our UK subscription boxes. For subscription boxes to be sent to Europe we charge an extra £2.50 and for deliveries outside of Europe we charge an extra £3.50. When you subscribe we aim to send out your first box the next working day (Monday to Friday). After that, we send all our subscription boxes out in the third full week of the month. For your first box you can also set a dispatch date instead – note that we don’t ship on weekends and please account for at least 1 extra day for packaging. If you are on the monthly payment subscription, we will charge you every month around the 12th. We’ll send you a notification email to let you know that payment has been taken. We then send out your box shortly after, during the third full week of the month. These payments will not stop unless you email us at team@cocoarunners.com to request a cancellation or suspension. Please be aware that subscription payments are non-refundable. The first box is sent out immediately - payment for subsequent boxes is taken on the 12th of each month and your box is sent out on the 3rd full week of the month. If you want to cancel you must notify us by emailing team@cocoarunners.com by the 10th of the month. If you receive a discount on your first box you must stay with us until your 3rd box has been dispatched. Can I get a dairy free, dark chocolate only subscription? Can I get a dairy free, low sugar 100% cacao chocolate only subscription? Can I get a milk chocolate only subscription? I don’t need more chocolate right now, can I take a holiday from my subscription? Yes you can. Please email us at team@cocoarunners.com and let us know how long a break you want to take and we can organise a ‘holiday’ from your subscription. Please note, you must email us by the 10th of the month in order for us to prevent this month’s box from shipping. If you notify us after the 10th, we will still ship this month’s box, but will be able to pause from the following month. Please note that we can’t suspend indefinitely, so you’ll need to let us know when you want the boxes to start renewing again. If you’re moving or want your boxes to be sent somewhere else, then please contact us at team@cocoarunners.com and we can update your details for you. Please note that you will need to email us before the 10th of the month to ensure that this month’s box is sent to your new address. Furthermore, changing the address on your account page will not always translate through for the subscription renewals. We request that you always email us to confirm that we have the right delivery address for you. Yes, you can purchase a 3,6 or 12 month gift subscription for a friend. Please click ‘Subscribe’, then select ‘Send a gift’. Follow the steps and we will dispatch their first box a date of your choosing! I don’t know my friend’s address or preference of chocolate, how can I gift them a subscription? We also provide a digital gift subscription, where you pay upfront for either a 3, 6 or 12 month membership of our club. You will then receive a gift certificate by email, along with instruction for how they can activate their membership. Please be aware that if your friend’s address is outside of the UK they will have to pay postage at the checkout when they redeem their gift code. Can I add in a gift message for the gift subscription? Yes, there is an option before checkout to add in a message so your friend knows who to thank for their chocolate. Currently there is only a monthly option available, however if you would like to skip a month (or two!) please contact us at team@cocoarunners.com and let us know how long you would like to pause deliveries for. 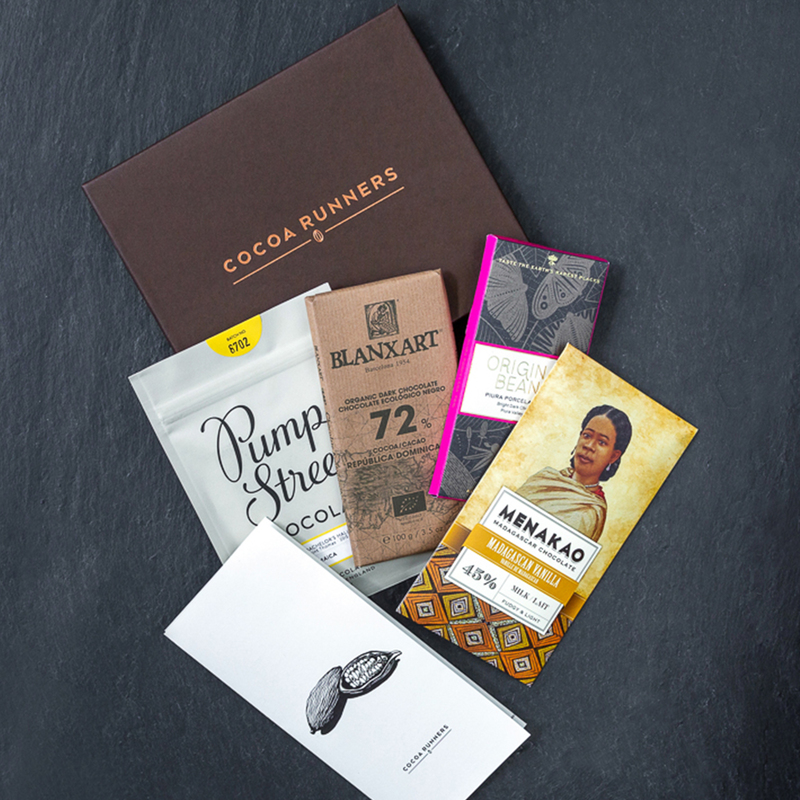 We know that you’re going to love your monthly chocolate delivery but if you wish to cancel your subscription, simply send an email to team@cocoarunners.com with your full name, the email address you signed up with and postal address, and we’ll do the rest. We’d also love to know your reasons for cancelling so we can improve our service in future. Give us the instruction, and we’ll do the rest. It is not possible to cancel your subscription until the first box has been dispatched and received. Equally, if you bought the subscription with a discount on your first box, you cannot cancel until after your third box has been sent. Please be aware that cancellation notifications must be sent before the 10th of each month in order for us to process the instruction in time before the monthly renewals. If you ask to cancel after the 10th of the month, your subscription will be cancelled as of your next payment date. Please note that subscription payments are non-refundable.